OUR LIVE MUSIC JUST GOT THAT LITTLE BIT BETTER! 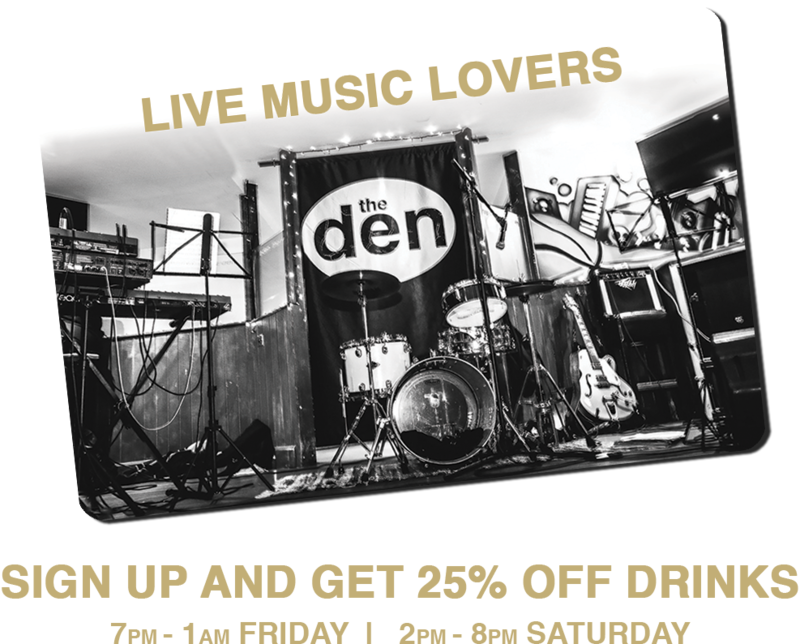 We love our live music at the den and to reward those of you that do too, we’re giving you 25% off drinks! Just sign up to our gig listings email and you’ll receive updates straight to your inbox with upcoming events and gigs. In return, show us your sign up confirmation email at the bar and we’ll give you a privilege card as a thank you. Are you happy to sign up to regular events email updates? Terms & Conditions: We ask you to show your welcome email on collection the loyalty card so we can ensure it’s one card per person. One card per email sign up. Excludes Fizz and Premium Spirits. Not in conjunction with any other offer. The management have the right to refuse service or stop this promotion at any point. Enjoy our free live music guys!